Spotify Classical Playlists: The Greatest 20th Century String Quartet Composer? The Greatest 20th Century String Quartet Composer? "Few people know Villa-Lobos wrote more string quartets (17 as far as I know from this label) than Shostakovich, works with the comparable originality and intensity. His earlier quartets are heavily influenced by Faure and Ravel, but already have his own voice, very uniquely southern-hemispherenisque and with sublimely lyrical slow movements. Later the works, the more original and more personal just like Shostakovich. But nature of the music is completely different. In his music you hear birds and animals in a way no other composers on our side of the planet could express. Some works have extraordinary organic complexity which sounds almost too daring. Danubius Qt plays like any top class ensemble in the world, with vivid imagination and warm & firmly centered tone. Actually they play far better than those famous quartets with major classical labels. I wish Malco Polo keeps these amazing 6 volumes permanently in cataloge." 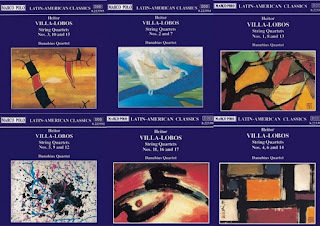 Here's the Spotify playlist: Villa-Lobos String Quartets (70 tracks, total time: 6 hours) Check out here for detailed information on every quartet. Thanks for putting together such a great playlist. Never listened to Villa-Lobos music before, it was a great way to start the day. The added-value solutions consist of tax credit score as well as motivation solutions ADP iPay My ADP Portal Login uses best-in-class technology to give services. Spotify Variations On The Theme Of 4'33"